The air was thick in a way that all Midwesterners have come to expect in a mid-July afternoon. The spectators gathered around the steeply banked corners of the track to get the best views of the action, and of the potentially violent entanglements that can happen at such high speeds. Some sought relief from the heat under makeshift tents and parasails, while others stood directly on the edge of the track, hands extended past their faces to shield from the sun that was beating down on the fresh asphalt track. It had been years since St. Louis had hosted a competitive track cycling race, but the city was now back in the spotlight with the newly minted Penrose Park Velodrome playing host to the 1962 U.S. National Track Cycling Championships. A velodrome is a hard surface, oval bicycle track with steeply banked corners, similar in appearance to a miniature N.A.S.C.A.R. track. The banking allows riders to maintain incredibly high speeds, some up to 50 miles per hour, around the corners. This new St. Louis velodrome was built as a result of the of the new Eisenhower Interstate system, which in 1960 had forced the demolition of a portion of Forest Park, and along with it, St. Louis’ prestigious original velodrome. In 1887, the St. Louis Cycling Club was formed, and is the oldest continuously active bicycle club in the United States. This prestigious club produced 10 Olympians as well as an Olympic team coach, and countless National and State champions over it’s long history. St. Louis also played host to the 1904 Olympic games, where track cycling was an event hosted on the cinder track at Francis Field at Washington University. Curiously, only Americans participated in any of the cycling events, leading to an unparalleled 21 cycling medals won, a feat that will likely never be matched. For the remainder of the 1960’s the 1/5th mile oval racing track in Penrose Park remained a premiere destination for cyclists across the country. In the early 70’s, a sewer pipe collapsed under one of the steeply banked turns, shifting the ground and the asphalt above it, rendering the track unusable. In a city facing much larger problems than repairing a bicycle racing track, the course fell into disrepair. In the early 1980’s, thanks for the efforts of Ray Forman Sr., the owner of A1 Bicycles in Kirkwood, the track was repaired and resurfaced. Unfortunately, the paving contractor chosen for the project oversold their experience with this type of project. The contractor was not able to roll the pavement concentrically (with the direction of traffic) instead opting to roll the pavement radially (up and down track). This created large seams that cut across the track. Those seams were below the grade of the track, welcoming rain water to channel down, resulting in large cracks. What should have been a smooth riding surface was now a bumpy and faceted surface that would eventually be nicknamed, lovingly and cynically, Mr. Bumpy Face. Despite the bumpiness, the track saw a resurgence in the 80’s. In the mid-80’s, Tom Brinker, a winner of multiple national championships, used the track to train for major events, although the conditions were not always ideal. The track was lined with thick overgrown brush that Brinker says would often double as a sniper’s outpost for neighborhood B.B. gun toting scofflaws. “It made you tougher,” said Brinker. That wasn’t the only hazard facing Brinker and other riders at that time. The lack of a fence allowed locals to drive vehicles onto the track, creating obvious additional hazards for cyclists. 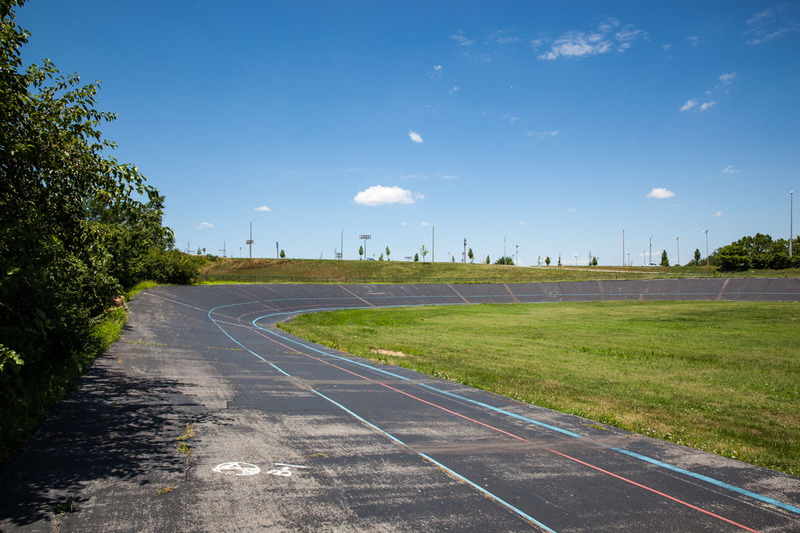 With no commitment of maintenance from the St. Louis Parks department the velodrome fell again into disrepair, and the track was officially closed by 1994. Another peak came in the mid 2000’s, with grassroots efforts raising funds to repair many of the cracks, and help smooth Mr. Bumpy Face’s complexion. Today the track is still quite bumpy, but is in good enough shape to host state sanctioned events, mostly due to the fact that it is the only track in the state, so the bar is quite low. 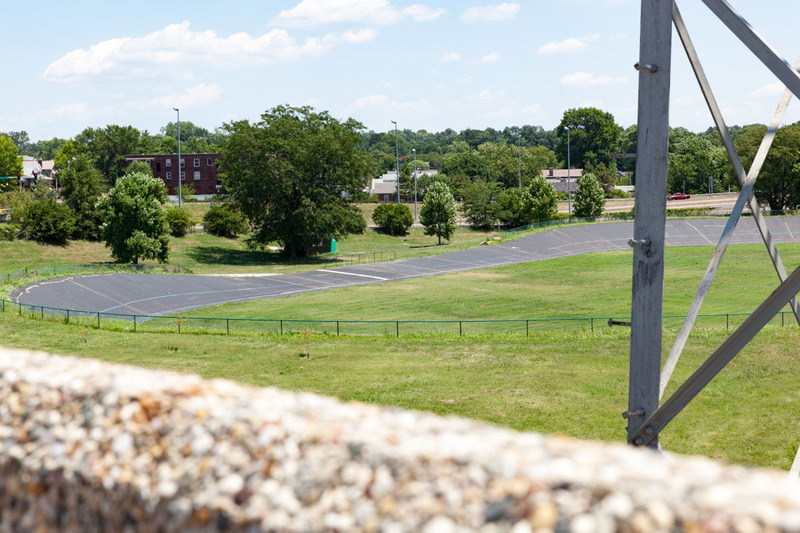 Momentum is building for another peak, with influential St. Louisans mounting an effort to save one of the last remaining outdoor velodromes in the country. Today, the velodrome, and track cycling in general, is something that most Americans are unfamiliar with, but this wasn’t always the case. At the turn of the 20th century, velodrome racing was an extremely popular spectator sport, drawing huge crowds around the world. The velodrome in Sydney, Australia drew a crowd of over 54,000 for an event in 1903. By the 1920’s, auto racing surpassed track cycling in popularity, and track cycling has since remained mostly a niche sport. 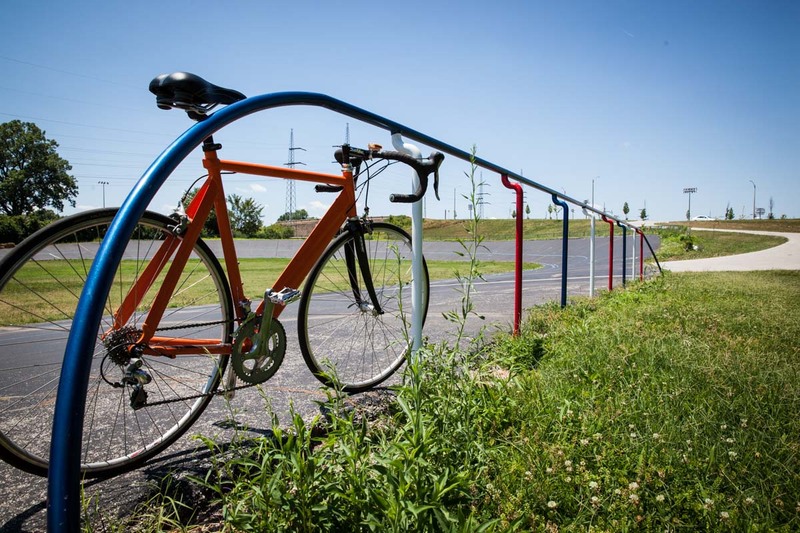 Today there are only 28 velodromes in the US, and Penrose Park is the only one in Missouri. With an endorsement like that, I had to visit the track myself to get an idea of what made this place so special to so many people. On a sunny April afternoon I headed up Kingshighway to the Penrose neighborhood on St. Louis’s North side. The entrance to the track off of a busy street gives an elevated view to the velodrome. The shape of the track, that looks like a giant Pringles brand potato chip, is strangely beautiful, an elliptic brush stroke of black across a field of green, man made but seemingly natural. The surface of the track is old and faded blacktop that reminds me of a childhood playground, a surface that played host to decades of kickball games, including a notable contest in 5th grade when Josh Schmidt kicked a ball over the head of the centerfielder and banked into a basketball hoop, still the most amazing athletic achievements I have ever witnessed. As I approach the track, I see very quickly the reality of the Mr. Bumpy Face name. Large cracks, and thick patches over former cracks, create a surface that looks bumpy to walk on, let alone ride a bike on at high speeds. In-field looks like an overgrown soccer field. Large flowered weeds peek out above of thick fescue. The track is lined with colored lines, blue, white red, blue, forming colorful concentric circles on the otherwise black track. The turns are intimidatingly steep, 12 feet incline at a 28 degree grade. Steep enough that walking up to the top of a corner from the infield requires a significant lean. A green fence surrounds the outer edge of the track, keeping back brush and the malicious. There is a storage trailer near the track used to store the loaner bikes and other track necessities. Next to it are several half-empty buckets of asphalt patch, temporary butterfly closure to the deep wounds across Mr. Bumpy Face. Interstate 70 is nearly touching the eastern corner of the track, and the sound of traffic, the nemesis and antithesis of the commuting cyclist, drones in the background. I’m not a brave biker. In college I had aspirations of being a casual cyclist, only to wipe out around a turn in front of a large group, hurting myself both physically and egotistically. Alone on the track, and overcoming the mildest case of PTSD, I push off and begin to pedal. I am pretty intimidated by the steep turn, and fear that without the right amount of speed I’ll be forced to the infield or the pavement by gravity. To my pleasant surprise, I found that the bike naturally wants to continue around the turn. The banking allows you to keep speed without actually turning, giving you the feeling that you are almost continuing in a straight line. Once I had my bearings I began to increase my speed and to venture higher and higher into the banking. I found myself smiling as I went around the track, bombing down from the high corners, exchanging from the outside lanes of the embankments to the inside lane of the straightaways, the wind in my face, and my grip tight on the handle bars, ever aware of the bumps. 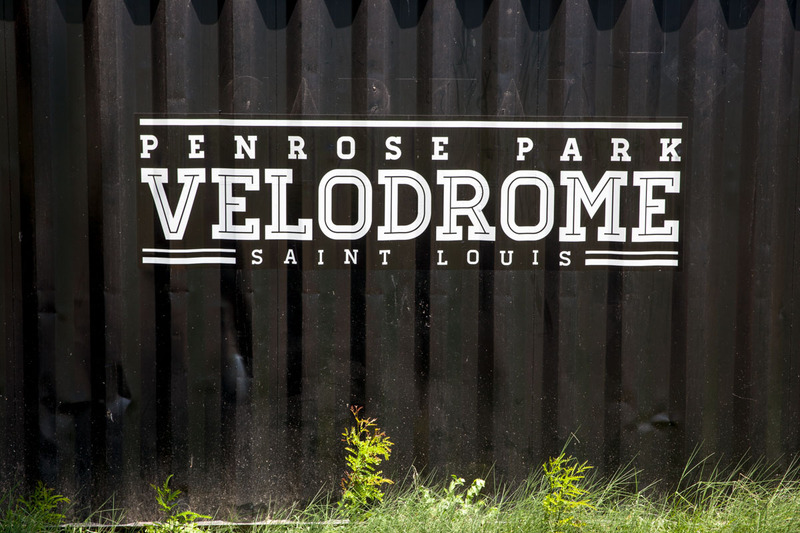 “What is completely unique about the Penrose Park Velodrome is that it is completely free and open to the public, compared to other velodromes across the country,” said Scott Ogilvie, the 24th Ward Alderman in St. Louis. Scott is an experienced cyclist and active voice in reviving the velodrome. St. Louis is known for its many free public amenities, from the art museums, to the Zoo, the history museum, Science Center, and many others. This is another free asset that adds to the quality of life to the citizens of the greater St. Louis area. But most of these signature amenities are located in the city’s central corridor, and none on the North side. This is a key element of what makes the Penrose Park velo so unique and important. Unlike almost all of the other velodromes in the country, the Penrose Park velodrome is not located in a mostly affluent, mostly white part of the city. The Penrose neighborhood, is located on St. Louis’s north side, and according to the 2010 census data, Penrose is 100% African American, and has a median income of around $23,000. Having a free resource like this creates an opportunity for people in the neighborhood a quality of life amenity that isn’t available anywhere else in the city, and provides young people an alternative structured activity. Part of the goal of those youth programs is to eventually have Olympic racers coming out of St. Louis again, as frequently happened years ago. But to achieve these goals they will need money, and lots of it.